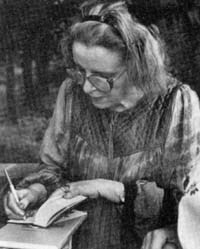 Vira Vovk, a Ukrainian poetess, prose writer, and playwright, was born in Boryslav, Lviv oblast. Fate cast her after the war to faraway Brazil. She has recently come to Ukraine — by no means for the first time — to bow to her native soil and conduct the presentation at the National Union of Writers of her book of selected works, bearing a both modest and significant title of Poetry . Vira Vovk is a Germanic scholar and musicologist by profession. She was for a long time professor of German literature at Rio de Janeiro State University. How does she manage to keep Ukraine in her heart in remote Rio de Janeiro? She never severed her ties with the Fatherland. She felt at home in the inner circle of the “Khrushchev thaw poets.” Of course, age was not the decisive criterion for Vira Vovk in her openhearted relationships with Iryna Steshenko, Hryhory Kochur, Mykola Lukash, Mykhailyna Kotsiubynska, Vasyl Stus, and Ivan Svitlychny. Ms. Vovk still keeps letters from the two latter (she wrote to them in prison camps where they were kept as dissidents), extremely human documents and a testimony to the epoch. Vira Vovk has done much for Ukrainian poetry to come to readers on the South American and other continents. As long ago as 1959 she published a translation of the Anthology of Ukrainian Literature. The year 1966 heard for the first time in Portuguese poems by Iryna Zhylenko, Ivan Drach, Lina Kostenko, Vasyl Symonenko, and others. She was responsible for a special edition of such Ukrainian classics as works by Marko Vovchok, Ivan Franko, Lesia Ukrayinka, and Vasyl Stefanyk. Later, in the 1990s, she published the Pysanky series, including a rich selection of modern Ukrainian poets, as well as prose by Valery Shevchuk. Incidentally, the books often came out at the translator’s own expense. Vira Vovk is the author of a whole series of translations. This calls to mind a stereotypical phrase: how could this frail woman do so much? I personally made indirect acquaintance with this wonderful poetess, coming across her collected poems Black Acacias kept at the Maksym Rylsky memorial library. This was perhaps the first Ukrainian-language foreign publication I ever held in my hands. The poetry struck me with its special intonation and the organic combination of what seemed to be impossible to combine: exotics and things Ukrainian. After reading her Iconostasis of Ukraine, I remembered best of all, for some reason, her poem about the famous wooden church in Chortkiv and went there specially to see it. At that time, in 1984, it stood shamefully neglected, only to be resuscitated later almost from oblivion. What does Vira Vovk write about? As every poet does, about the larger world around and her place in it. History, art, religion, and nature outline her poetic interests. Having begun writing in early childhood, she has published twelve collections of poetry and seven of prose, seven pieces of drama, as well as translations: the one mentioned from Ukrainian into Portuguese and into Ukrainian from the original languages of Neruda, Claudel, Lorca, Tagore, Gheorghe, and others. Her sensitive soul cannot live without music and the fine arts. Her favorite composers are Bach, Wedel, Schumann, and Villa-Lobos. She recalls a long period of her life under the sign of Beethoven, Mozart, Cesar Frank. Once Ms. Vovk brought from Brazil to Ukraine the baroque music ensemble Tandaradeiros, which showed a high level of culture in singing Ukrainian classical pieces, folk songs, and psalms. Ms. Vovk told us she and her foster sister, artist Zoya Lysovska, had taught the singers to pronounce Ukrainian texts. All the six ensemble members, who visited Kyiv, Chernivtsi, Ivano-Frankivsk, Lviv, Poltava, and Dnipropetrovsk, were fascinated by our land and culture. After touring Ukraine, they presented the same program in Germany, Switzerland, and France. Zoya Lysovska, a prominent Ukrainian artist, has in fact co-authored many of Ms. Vovk’s books. As to the poetess’s selected works recently presented at the National Union of Writers of Ukraine, they were finally illustrated with reproductions of the works by our famous ceramics painter Halyna Sevruk. Ms. Vovk herself is also the creator of the subtle quaintly philosophical “embroidery” that embellishes many of her publications.